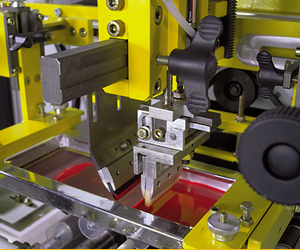 Screen printing is a unique process among the printing processes. The principle consists of forcing the ink using a squeegee through the open mesh of a screen in order to apply the ink on a support. For this very reason, the layer of ink applied is far superior to all the other printing processes. Screen printing originated in Far East. Known in Europe under the name "Impression à la Lyonnaise" it was mainly used to print on textiles. The unique characteristic of screen printing - compared to other printing processes - is the fact that the print is done through the cliché (screen) and not by transferring the cliché on the part. It is also not restricted by the nature or shape of the part: flat and developable shapes (cylindrical, oval, tapered/conical). Reproduction of canvas, advertisements, posters, labels, etc.